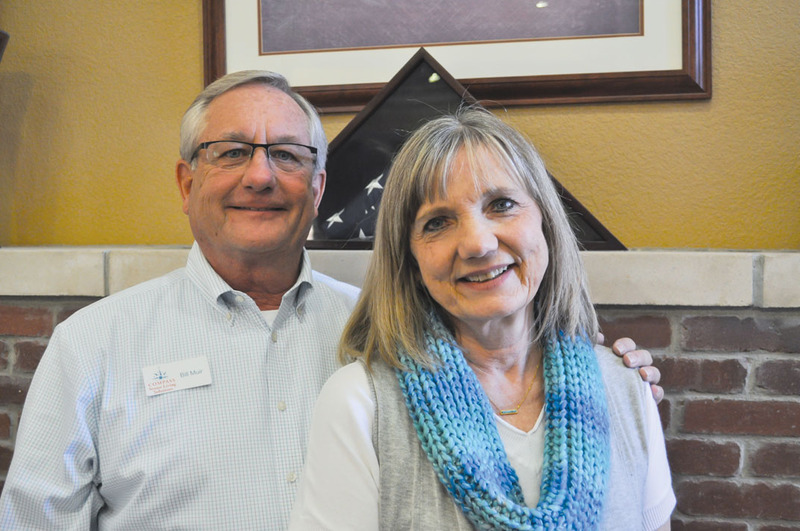 Bill Muir, and wife Karen, provide guidance and support for seniors needing to make a transition. Over the course of the last 15 years, Bill Muir has held a lot of hands, eased a multitude of fears and moved more than a few boxes. As owner of Compass Senior Living Solutions, Bill, and wife Karen, focus on the next step for families who are in the midst of making important living decisions. Do I need an independent or assisted living community? Will this community help me thrive and get more out of life? Can I afford what I need and where can I go to find out? The Muirs answer all these questions and more, offering a one-of-a-kind concierge service in the metro all at no cost to the client. Muir’s business is such that most times he gets a phone call from a distressed family member. Overwhelmed, stressed and under time constraints – the call relays the urgent need for mom or dad, grandmother or grandfather to find a new living situation. All too often families are asked to make future living decisions within the span of a day or two when their loved one enters the hospital after a fall or sudden illness that makes it apparent they won’t be able to return to their home. That’s where Compass Senior Living Solutions comes in. * Bill or Karen will meet with you or fill out a brief evaluation over the phone. They will discuss what changes are going on in your life and determine what type of community will meet your needs. * A review of your financial resources and communities that fit your budget comes next. Bill can also search out financial resources that can save you money if you qualify. * Finding the area you are most interested in living and choosing three or four communities to tour follows. They will accompany you – or provide transportation if necessary – on tours to help you evaluate the offerings of each community. The best part is the service is free to families and those who refer to him. “I’m unbiased and my fees are paid by my communities,” Bill said. “Unlike my competitors, both Internet and other local referrals services my rates are all flat. That means Muir is beholden to no one but his client. What sets Bill apart is his experience from the other side of the door working for communities in the metro. He spent the last 15 years marketing senior living communities. “I know the information those assisted livings need and I know where to go get it,” he said. “Most assisted referral resources just spread names, point people in the right direction but they don’t do the most important part which is holding that family’s hand and helping them navigate through this whole thing all the way through move-in process. Move-in day is a big one not only for families but Bill himself. He’s there early to make sure promised arrangements have been made. He’s making sure medications are in place and ready to be dispensed and care plans have already been established by providers and are ready to go. Bill also utilizes his sister, Vicki Muir – a 30-year case manager and social worker. In addition, he’s a licensed long-term care insurance agent who no longer sells products but helps clients navigate the lengthy process of filing for benefits. Uncovering forgotten aid and attendance benefits is another service Compass provides. Over the past decade Internet services claiming to help find a place for mom or dad, have sprung up. It’s often a one-way street. Muir’s service overlaps so many professions. He’s part real estate agent, counselor, confidant, life coach and negotiator. He’s been there as people have agonized over decisions and he’s also seen the worry melt away with the right fit.